Call tracking is beneficial to any business that receives leads from phone calls and can actually prove valuable to your SEO strategy. Optimize the marketing budget to favour more efficient marketing channels. Call tracking is useful in both measuring the effectiveness of offline (billboards, ads in newspapers) and online (PPC, SEO efforts, retargeting) marketing channels, which makes it an integral part of an omnichannel marketing strategy. Without analytical data on phone calls, you cannot have a clear picture of your customer’s experience with your brand. So how does Work Call Tracking in SEO? The basic idea of call tracking is to assign different phone numbers to different marketing channels, in order to discern the source of a phone call lead. In the early days of call tracking, marketers would put various phone numbers on their business’s website, which would conflict with Google’s requirements for the NAP (which stands for Name, Address, Phone Number directory). Google wants NAP citations to be consistent and uniform, and call tracking endless variations of company phone numbers would confuse Google’s algorithms and result in lower rankings. This conflict was the reason for the call tracking controversy. With updated technology, it is no longer an issue. The keyword that brought the person to the website. The agent who picked up the phone. Practical advantages of call tracking for your SEO efforts. That’s right—call tracking services are capable of discerning the path of your customer to your landing page, starting with the keyword. Having that information, you can determine which keywords worked best for your landing page and resulted in a conversion. If you decide to a/b test the landing page, it will give you valuable info for optimization. When a person uses your website to phone your business, he or she is making a conversion. Tracking calls from the highest converting pages mean understanding where your conversions come from. This helps you understand–and optimize–the pages that work better and generate more conversions. The main goal of SEO is not to attract traffic for the sake of traffic, but to increase the number of conversions, deals, and sales generated by your website. For an SEO specialist, or anyone running an SEO campaign, it is essential to have a reliable indicator of whether or not your traffic is converting, which is the real value for your business. 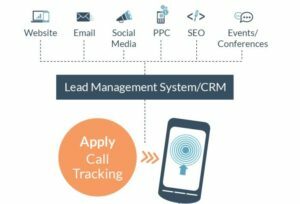 Call tracking can fill this gap neatly, as it tracks conversions and ties them to your website, giving a clear indication of what works best. Call tracking has become indispensable for many businesses. However, there are still some who believe call tracking could harm SEO and the performance of your website. This simply isn’t the case. With modern technology and dynamic number insertion, call tracking doesn’t conflict with SEO. On the contrary, there is a wide-variety of useful data provided by call tracking analytics, with benefits to your marketing strategy.Moreover, call tracking can be used to enhance website performance and make SEO more efficient.